PlayPopGames is an application that should enable users play all kinds of games on playpopgames.com for free. In most cases, users install this application themselves; however, it is known that this application might also be available for download on other third-party websites. Such versions might be modified and thus quickly cause harm to the system. Unfortunately, the version that can be downloaded from playpopgames.com is not very decent too. In fact, security specialists even tend to classify this software as an advertising-supported application (adware). We will explain you why it is so further in this article. In addition, we will provide more information on the removal of this piece of software in case you decide to get rid of it after reading through this article. Even though PlayPopGames is available on the web and anyone can download it, specialists have observed that this application is primarily targeted at users living in the USA. If you live there, you should be very cautious all the time. Of course, other users cannot be sure that they will not encounter this program too, so we suggest being very careful for them. If it happens that this software still manages to sneak onto the computer, remove it immediately because it might act in an undesirable way. PlayPopGames shows a fixed number of ads to users that have the software installed. We spend a lot of time and effort maintaining our numerous FREE games so help us by installing this software! As this software is going to show advertisements, specialists classify it as an advertising-supported application (adware). It is quite dangerous to keep adware installed because it will display ads and nobody knows where they will really redirect users. There is also a possibility that all these ads will disrupt the browsing session. You should ask yourself whether you really want to keep a suspicious program installed. In our opinion, it is better to delete PlayPopGames from the system. You should do that not only because it shows ads and might interfere with your activities on the web, but also because this application might gather information about you. Fortunately, it promises not to gather personally-identifiable information; however, we are sure that it is going to record details associated with the users’ browsing data. The only way to put an end to this is to erase this adware from the system. 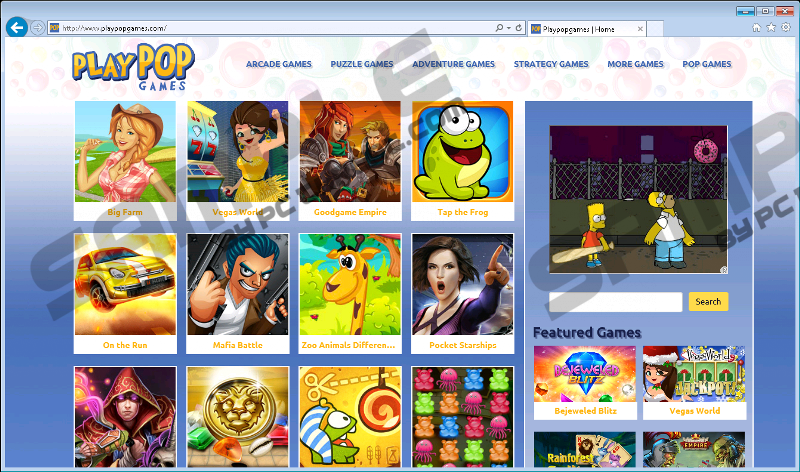 Actually, not all the users find PlayPopGames on its official website and download it from there. Specialists have managed to find out that this adware program might also travel in software bundles and sneak onto computers rather secretly. Even though PlayPopGames usually comes in software bundles with freeware and shareware, specialists say that this adware might also travel in bundles together with untrustworthy applications too. In order to find out whether untrustworthy software has really been installed alongside PlayPopGames, we suggest scanning the system with an automatic malware remover. You can download the scanner from our web page – click on the Download button. Many users want to ask us how to prevent malicious software from slithering onto their computers. Actually, one answer does not exist; however, you will not encounter malware again if you download software from trustworthy websites only, install new applications carefully, and acquire a security tool on the system. Also, do not forget to make sure that you install only 100% trustworthy software. If you do not know whether the program is trustworthy or not, read users’ reviews on the web before you install the software. If you cannot find any information, do not install such software at all. If you have started seeing advertisements with the PlayPopGames name on your screen, there are 99% that this adware program is installed on the system. It has been observed that this application has an uninstall entry, which means that it will not be very hard to get rid of this infection. If the manual method is still too hard, delete PlayPopGames automatically. We suggest acquiring SpyHunter for this matter. Find the unreliable software and select it. Quick & tested solution for PlayPopGames removal.